The 3 foot (1 m) by 3 foot (1 m) X-Y system is mounted to a granite slab. 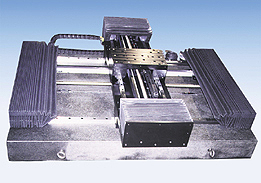 Square rail linear bearings, gound ball screws and linear encoders are used on each axis. Heavy duty waycovers are used to completely protect all components of the system. Stepper motors are mounted to each of the linear stages and are used to control the movements of the entire system.